We are truly blessed to be within driving distance of the one of the best children’s museum in the country. 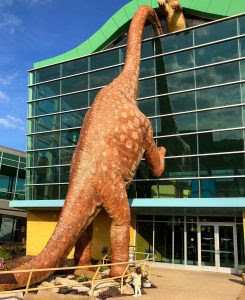 The Indianapolis Children’s Museum holds the title of the World’s Largest Children’s Museum which encompasses the museum itself, 12 sports experiences, and three exhibits in the Riley Children’s Health Sport Legend. The 482,950 square-foot campus sits on 29 acres – humongous! 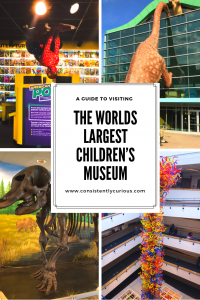 The mere thought of tackling this national treasure can be overwhelming, therefore, we are here to give you a complete guide to visiting the world’s largest children’s museum. 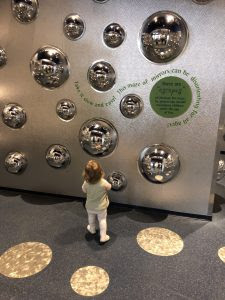 The Indianapolis Children’s Museum was founded in 1925 after Mary Carey, an education advocate, rallied the civic leaders to form a children’s museum after her visit to the Brooklyn Children’s Museum. Hence the Indianapolis Children’s museum was born. A few of the earliest donations to the museum were a porcupine fish and an arrowhead. Through the years the collection has grown to over 120,000 artifacts! A few of us may remember our parents taking us to the museum decades ago, when there was replica of a limestone cave that visitors could navigate through. This popular exhibit was demolished because it needed to make way for the Scienceworks gallery. The children’s museum is conveniently located a few minutes off the highway. Pulling up, visitors are greeted by their resident brachiosaurus peering into the museum. A parking garage is located across from the museum and is free to museum patrons. A sky bridge connects the garage to the museum — try to park between the second and third floor as this is where the entrance to the sky bridge is located. Elevators, ramps and stairwells are located in the garage. 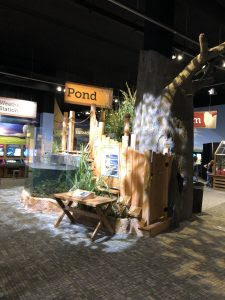 A general admission ticket to the Children’s Museum includes access to the Riley Health Sports Legend Experience — the outdoor experiences are only open seasonally. Hours are 10:00 a.m.-5:00 p.m Tuesday-Sunday. During the spring and summer they also open on Mondays. For the most up-to-date information on hours and pricing check on their website. 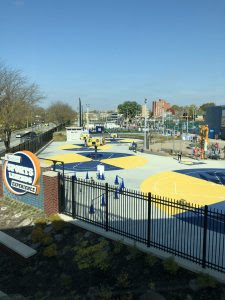 Crossing over the sky bridge one can’t help but notice the Sports Legend Experience outdoor exhibits. Children can been seen shooting hoops, throwing football, or discovering the secrets hidden in the massive Tree House of Sports. 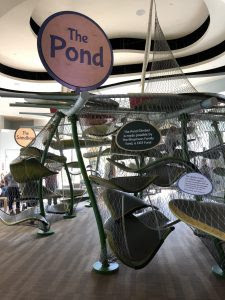 This fun filled exhibit encourages physical fitness, all while children learn about sports history and health education. After learning about their favorite sports heroes, children get to experience the same sport they excelled in and more. During the winter months only three indoor exhibits are open, however the outdoor experiences reopen in the spring. Accessible opportunities are available throughout the exhibit, including a lift into the tree house. Toddlers get a chance to be part of the team as a few of the areas have been designed with them in mind. There is a toddler golf course, 4-foot basketball hoops with tiny basketballs, and a toddler slide in the Tree House. Take a GIANT step back in history as you enter prehistoric times and walk among the dinosaurs. 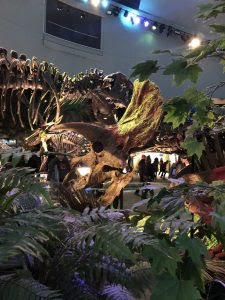 Visitors are transported into a world where a storm can pop up unexpectedly, digging for fossils is an everyday activity, and full-size, real dinosaur fossils are around every corner. The Dinosphere is home to Leonardo; one of four mummified dinosaurs in the world! Everyone will love watching real paleontologists work in their lab and have the chance to ask them questions as they work. Don’t forget to touch the real life T-Rex bone after dressing up as your favorite dino! Travel back to the 1890’s and catch a ride on the historic Reuben Wells, a 55-ton steam engine. It was the world’s most powerful locomotive back in its day. Work the ticket counter, hop on the passenger car and don’t forget to crawl inside a tunnel to see miniature trains hard at work. The train table is popular among tiny museum patrons as they love to create their own locomotive adventures. Fun fact: the museum in its current setup was actually built around the locomotive, not the other way around! 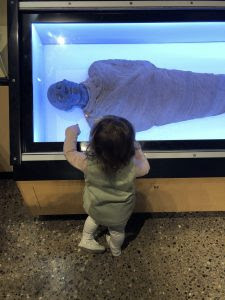 Embrace your inner archaeologist and explore a Caribbean shipwreck, uncover China’s Terracotta Warriors, or solve the mysteries surrounding an Egyptian tomb. Children of all ages will be enthralled with watching real archaeologists working on artifacts in the lab. 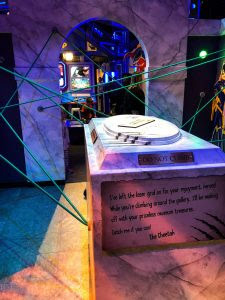 Interactive exhibits puts them in the middle of the action by reconstructing a terracotta warrior, discovering a mysterious tunnel in a pyramid, or strapping on a “scuba tank” for an under the sea adventure. 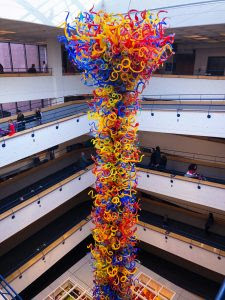 An impressive 43-foot-tall tower of more than 3,000 pieces of blown glass stands proudly in the middle of the Indianapolis Children’s Museum. This spectacle was created by Dale Chilhuly, a renowned artist whose works of art are treasured by many. 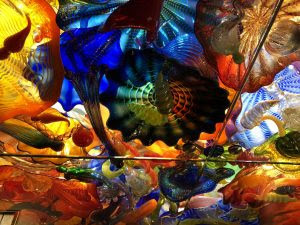 The glass ceiling of the exhibit below the tower is a kaleidoscope of color and brilliance. Create your own masterpiece with the bright plastic shapes that resemble those in the display. Take a look around the international space station and become an astronaut for a day. Learn how astronauts spend their days in space, try on space gear, and visit the planetarium for a special film. We spent a good amount of time here as this area is designed for children five-and-under. Fair warning this is a very busy exhibit as this is home to the beloved water tables and sand boxes. Music and art studios will have activities scheduled through the day which will give a little reprieve to the area. The toddler area has a gate with a padded infant area enclosed in it. To be honest, the gated toddler area was nothing special as I have visited play cafes that offer more. 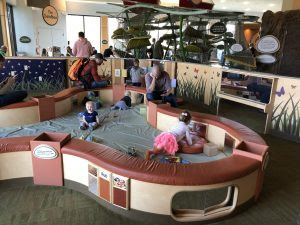 Take your little one to experience more of the unique features of the Playscape or the museum in general. This is a great area for parents who need a breather! Family bathrooms, a private nursing area for moms, and diaper changing stations are available. Little explorers will get to discover how scientists are changing our lives on a daily basis. Curiosities will be piqued as you examine field journals, step into the life of a farmer and learn how water is cleaned and managed. 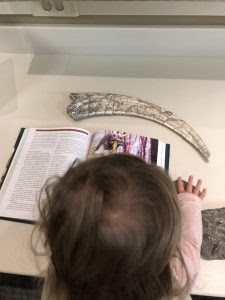 Even though our daughter was a shade too young to appreciate all the fascinating facts and displays, we enjoyed them as adults. I left understanding a lot more than when I went in. There is even a Geology lab where you can see and touch a variety of minerals. The museum always has new and exciting exhibits lined up. 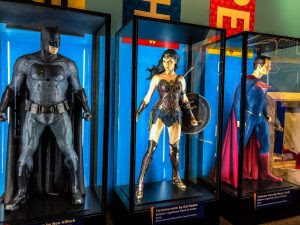 While we were there we got to experience the DC Superheroes Exhibit. Discover your inner super heroes and defended Gotham from evil by tracking down villains. We loved looking at the original costumes (Ben Affleck, from Batman, among others) from the movies and some truly unique artifacts (i.e. Superman’s Cape from Superman II) from the films. Afterwards, head over to The Science of Ripley’s Believe it or Not! 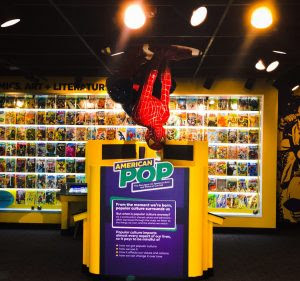 This exhibit is filled with the oddest and quirkiest things imaginable. 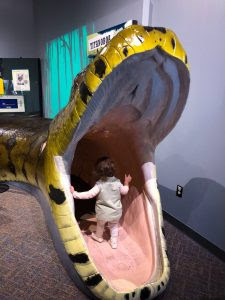 Crawling through a prehistoric snake was a highlight of this collection of “curioddities” for my daughter. However I found the unique artwork made up of everyday items fascinating. You will have to see some of them for yourself! Check the museum’s website for when new exhibits will be arriving and other ones leaving. Throughout the museum there numerous exhibits and displays aimed at children over 8 years old. Guests were speaking highly of The Power of Children and Galleries for American Arts and Popular Culture. The Sports Legends Experience is a favorite by older children as well. No trip the museum would be complete with a ride on the historic carousel. 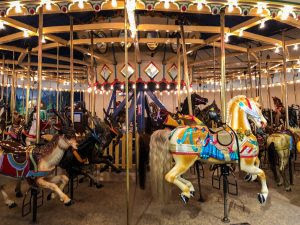 Dating from 1917 the carousel animals were salvaged from the original ride that was in Broad Ripple Park. A machine (which takes credit cards, even!) is available in line for you to purchase your ride tokens at $1 per person. After your ride head over to the Lilly Playhouse area where child-size playhouses open up imaginations and endless creative play. A little word of advice, eat before you start exploring. 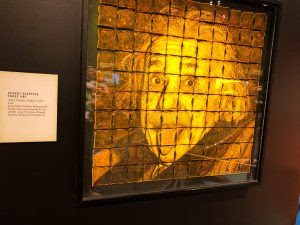 Whether you opt to have snacks before arriving or have lunch at the food court eating a little something before discovering the museum is highly recommend. The museum has a lovely food courts with a good selection of hot and cold entrees. Preparing food with high standards is a priority. We got to witness an employee checking the temperature of each chicken tender leaving the fryer. It is such a relief, because they know that the chicken is likely going to be fed to someone’s precious little one. High chairs are available in the food court area. Don’t try to see the whole museum in one day. Go in with a plan on what exhibits and displays your family wants to see and attempt to stick to the plan as best as possible. It gives you a great reason to return another day. There is a sensory map available that indicates which areas of the museum are sensory-heavy, as well as those that are less stimulating. Diapering facilities can be located on all levels and emergency baby supplies are available at the Concierge Desk. There is a special branch of the public library located inside the museum. InfoZone was one of the nation’s first- and remains the only free, full serviced library located inside the museum. The library can be located in the main atrium before entering the museum. The gift shop is the best toy store around. Be sure to allocate a few minutes and dollars to noodle around through here. Check out Lilly Theater for a 45 minute show and check the schedule for special programs. Meltdowns will likely happen multiple times throughout your visit, often when leaving. While some are inevitable, try to prepare your child for leaving by letting them pick out one last thing to do before moving on. 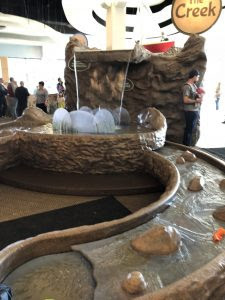 Be sure to check out the amazing water-clock located in the atrium! We hope that your family has a wonderful visit to the World’s Largest Children’s Museum. We are looking forward to making this a yearly pilgrimage from Cincinnati and making more great memories. 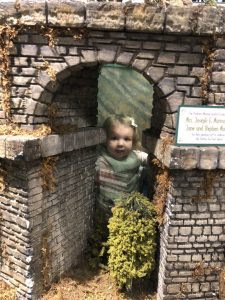 If you are looking for more family friendly activities in Indianapolis, look no further! Chatter about this museum keeps popping up everywhere. Makes me excited to visit one day! Love this guide!